Michael Angelakis is a seafood industry legend and one of its great personalities. 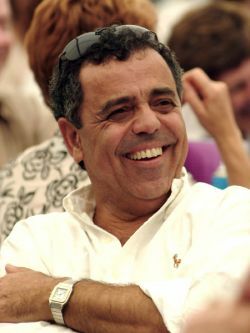 Former Managing Director of the family business Angelakis Brothers, he is just as well known as one of the two larger-than-life presenters of the popular TV program Out of the Blue. He took over the reins in 1985 and spent 30 years growing the business in size and reputation. Angelakis Brothers now has two processing and distribution plants and three retail outlets, and is a national supplier to supermarkets, wholesalers and interstate distributors. Michael has also been heavily involved with the South Australian Tourism Commission, the Premier's Food Council and the Australian Fisheries and Seafood Forum, and in 2009 was inducted into the Hall of Fame at the annual South Australian Premier's Food Awards. "There are two things that make South Australia a successful state," he said. "One is the people - our producers, farmers, fishermen and winemakers - and the other is the quality of our products. "We want to be the best at what we do. That means being innovative. Let's be sustainable, let's be creative, and let's go to the markets."